The Staunton Country Club is more than a golf club. It is a place to socialize, eat, drink and have fun. 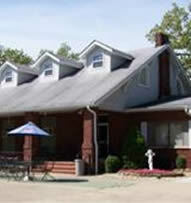 From small families to large groups, the club accommodates everyone. Stop by the informal restaurant/bar for a quick bite to eat. Order one of the delicious menu items and eat as you watch the big screen TV. The big screen TV features the biggest sporting events, so cheer your team to victory as you enjoy your lunch or dinner. Be sure to stay for a drink after your meal. From ice-cold beer to mixed drinks, the bar provides lots of options for thirsty guests. As you sip on your cocktail, pull out a deck of cards and play a game. The restaurant encourages people to stay and socialize, even after the last plate is empty. Do you love the smell of barbeque? Bring your food to the club and grill outside onto the deck or under the pavilion. If a picnic is more your style, pack a sack lunch and grab a spot outside. Munch on your sandwich as you look at the gorgeous trees, manicured greens and blooming flowers. After your barbeque or picnic, slip off for a dip in the pool or some practice on the putting green. Then, go back to the deck or pavilion and spend some more time with your family and friends. When it’s time to celebrate, the Staunton Country Club is here for you. Rent the hall adjoining the bar and dining area. You will have plenty of room to spread out, socialize and enjoy your event. Members and non-members can rent the hall. Click here for the Hall Rental Contract. The hall is also the place for club-sponsored events. Try to fill your card at Bingo, or tap your feet to the band. The hall also has special dinners. Fill up on delicious food while you talk to your friends and family. Enjoy the day at the Staunton Country Club. Play a round of golf, take a dip in the pool and make use of our facilities. See why so many people call the Staunton Country Club home.